Of course at this late day it would be impossible to correct the great injustice done to poor Gordius. Nevertheless, as true blue puzzlists we can condemn the high-handed manner in which Alexander the Great, competing in a puzzle contest, proceeded to make himself the umpire and awarded himself the prize for his absurd solution. He established a dangerous precedent and encouraged a kind of puzzle brigandage which is not extinct to this day. We often find young Alexanders who would like to solve puzzles according to their own notions and capture prizes after the manner of pirates. Gordius was an unsophisticated countryman who raised sheep and grapes, but who by his extreme cleverness became King of Phrygia. 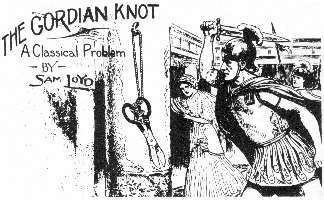 It is told that when he assumed the scepter he tied his former implements with what is known in history as the Gordian knot, but in such a peculiar way that the knots could not be unfastened. The oracles proclaimed that whoever could untie them would become emperor. Alexander the Great, it is said, made many ineffectual attempts to untie some of the knots, but finally becoming enraged at his want of success, drew his sword and cut the cord, exclaiming that "such is the common sense way to get a thing when you want it." Strange that those familiar with the story and its contemptible climax indorse it with a certain air of assumed pride when they have surmounted some difficulty and exclaim: "I have cut the Gordian knot!" Did not undo by cutting it in twain. In presenting this puzzle, I have drawn largely upon encyclopedia lore, but have conformed strictly to the Description as I find it. They all agree that the cord was so fixed that no ends could be found and that the implements of husbandry were tied to a staple in the temple of the gods. I have taken Lattimer's intimation that the implements may have been tied separately, and I accept his reference to the pruning shears as being worthy of special illustration. The puzzle is designed especially for summer outings, and should become popular at the seashore as well as the mountain resorts. It can readily be solved by patience, perseverance, and quiet study. It is a puzzle to be solved in some quiet nook, "far from the maddening crowd." Get a piece of cord about one yard long, tie the ends together to make an endless piece. Take any kind of ordinary scissors and arrange the string exactly as shown in the picture, only instead of fastening the cord through the staple, throw it, like a necklace, over the head of a young lady, seated in a convenient position, who will aid you to win the crown of Asia by removing the scissors. The scissors are removed from the cord by working the looped end back along the double cord. First through the left ring, then the right ring, then left, then right. Now pass the loop over the entire pair of scissors and it will come free unless you have produced an unfortunate tangle by twisting the cord. Can you better Sam Loyd? See also the story of my logo.